The lamb chops came from The Smokehouse of the Catskills, always a reliable source for wonderful meat. 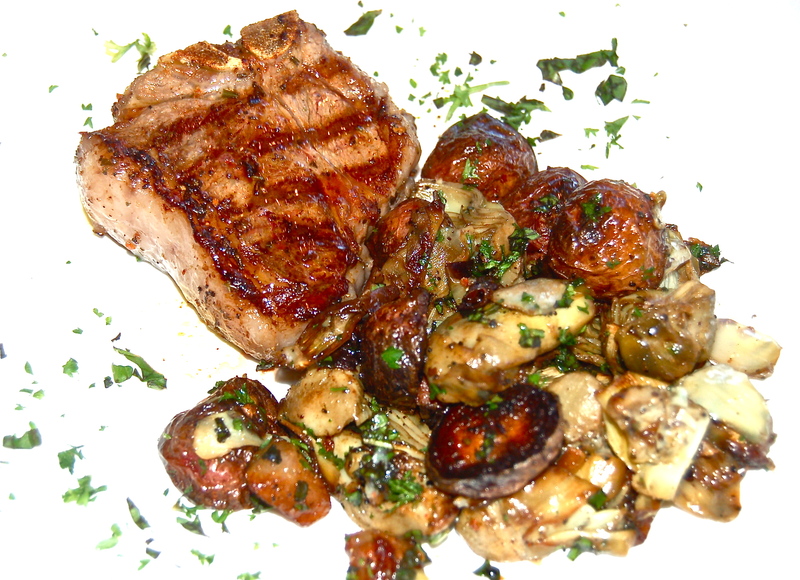 The chops were marinated for a few hours with fresh Rosemary leaves, Lemon Juice, Salt and Pepper and EVOO. A simple but a highly flavorful combination. Plated with the potatoes and artichokes, delicious food was put on the table. A side dish of Heirloom Tomatoes with finely diced Basil Leaves rounded out the dinner. 1. Heat a cast iron grill pan to high. 2. Remove the chops from the marinate. 3. Add the chops & grill for 2 minutes. Turn the chops diagonally & grill for another 2 minutes. 4. Turn the chops & repeat the grilling procedure. When an instant thermometer inserted into the center of the Lamb registers 120F degrees, they’re rare. Another few minutes to 125 & they’re medium rare. 1. Heat a deep sided saute pan, add a thin film of EVOO. 2. Add the Garlic & saute until tender & lightly colored. 3. Add the Artichokes & saute until deeply colored & tender. Remove to a bowl. 3. Add the potatoes & saute until deeply colored & tender. 4. Return the Arichokes & Garlic to the pan, cover & cook to be sure that everything is tender. 5. Add a splash of EVOO & season to taste.